Sydney, 20 May 2014 – The tide has turned in the Sydney sublease market, with the quantum of available office space having halved in the past seven months. 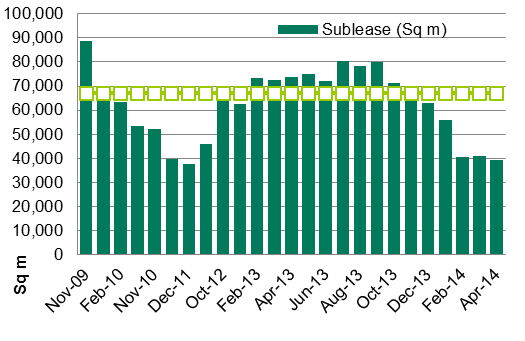 New data from CBRE shows that just 39,500sqm of sublease space is now available – well down on September 2013 when circa 80,000sqm of space was being marketed. CBRE Senior Director, Office Services, Jenine Cranston, said very few new sublease options had come to the market in April and all had been for less than 500sqm of space. “The quantum of available sublease space is now well below the historical average, after declining every month since September last year,” Ms Cranston said. CBRE’s Sublease Barometer highlights that the finance and insurance sector remains the largest contributor of sublease space in Sydney, however in line with the overall trend the amount of space being offered by this market segment has also halved since September. “This is on par with Melbourne, the other main finance led market, and is an indication of the more positive business sentiment in this sector nationally,” Ms Cranston said. There are currently just three sublease options available for over 2,000sqm of space, with two of these being from finance and insurance sector tenants. This is down from a total of nine leases greater than 2,000sq m in September last year. The majority of Sydney CBD sublease is in the city’s Western Corridor, which accounts for 47% of available space. The City Core accounts for 35%, with Midtown and the Southern precincts accounting for 10% and 8% respectively. “Twelve months ago, a significant proportion of sublease space on the market came from tenants who had relatively short lease tails but believed they had enough time to get rid of space. They did not understand that incoming tenants wanted long term certainty in deal structures,” Ms Cranston said.